A toxic smog chocking the Thai capital forced officials to close hundreds of schools Wednesday amid escalating efforts to manage the pollution crisis, Agence France-Presse reports. Bangkok, which has been enveloped in a dense haze for weeks, registered an “unhealthy” air quality index (AQI) of 174 on Wednesday, according to Air Visual, which tracks pollution. When the index hits 151 or above, people are typically advised to stay indoors. The persistent smog has prompted a slew of desperate measures to clear the particulate-filled air. Workers have been dispatched to water down the roads, closed some factories and cautioned against Chinese New Year celebrations involving burning paper and incense. Earlier this month, officials even tried to make it rain through cloud seeding. But with the toxic matter still lingering as of Wednesday, Bangkok authorities ordered all 437 city-controlled public schools to close from lunchtime through Friday, AFP reports. They also declared a 580-mile portion of the city a “control area”. Authorities will also begin to use drones to spray a sugary liquid solution clear out microscopic particles in the air. 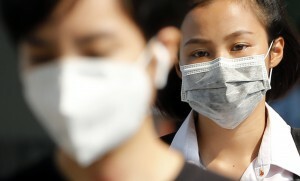 This is the second year in a row that Bangkok has been shrouded in a toxic seasonal smog. Officials have pinned the worsening air on everything from car exhaust, to factory pollution trapped in the city, to relentless construction.